On June 11th, Vin Diesel returns to the big screen as Richard B. Riddick in what is sure to be a blockbuster summer hit, "The Chronicles of Riddick". But before it hits theaters, Rittenhouse Archives will release their trading card set based on the movie on June 2nd. 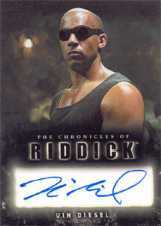 The movie is filled with action, suspense and special effects all of which have been captured in The Chronicles of Riddick trading card set. This series also features an exclusive 18-card chase set covering Pitch Black, the movie that started it all. Each box will also contain two autograph cards from the stars of the movie! The one thing that you will NOT find in this product are redemption cards, unlike other movie trading card sets from other manufacturers. Rittenhouse Archives strives to ensure that our boxes not only have value but also shelf-life.